Arenas on his way to court. This one wasn't made of hardwood! 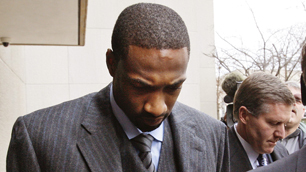 —Gilbert Arenas pleads guilty to felony gun possession. He is supposed to be sentenced March 26th. This article does a great job of telling the story. —Derek Dooley hired as Tennessee football coach. Some argue that Mitch Barnhart panicked in 2007 after Billy Donovan and Rick Barnes rejected his offer to become UK’s next coach after Tubby Smith left. The result: Billy Gillispie. To say that Mike Hamilton (UT AD) panicked after Lane Kiffin left is an understatement. Dooley is 17-20 as a head coach. Less than impressive, especially by UT’s standards. Dooley may be a young coach with a lot of potential, but that’s not what Tennesee needs or wants. —Southern Indiana basketball player may have died from a heart condition. There are still some tests to be done, but it looks as if the cause of his death may have been due to an enlarged heart. It sounds like Lewis will really be missed. —Quick shout out to Natalie Novosel, who plays basketball for Notre Dame. You might remember her from her days at Lexington Catholic. Today will be the first ever ESPN College Gameday that features a match-up of two women’s teams. Novosel’s Fighting Irish will take on the UConn Huskies. Both teams are undefeated. Congrats and good luck to Novosel! 1974- Mickey Mantle and Whitey Ford are elected into the Baseball Hall of Fame. Again, no steroids. 1988- The St. Louis Cardinals of the NFL announce their move to Phoenix. Roy Jones Jr.- Boxer (1969) from Pensacola, Fla.
Joe Flacco- current QB of Baltimore Ravens (1985)…wonder what he wants for his birthday??? I hope everyone enjoys this weekend of sports!